This property enjoys gas central heating, a mosaic clay tiled floor in the hall with various arched features on the ground and first floor, beautiful landing and small paned sash windows throughout. Please click on our virtual tour and take a look around. 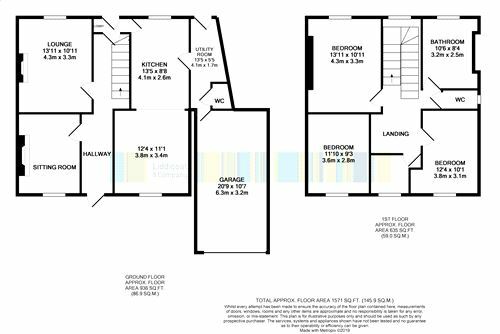 In summary the accommodation comprises of entrance hall, dual aspect kitchen and dining area, leading through to a utility area with cloakroom and door accessing the garage. From the kitchen area there is a small lobby to the rear garden which then leads back to the hall and two reception rooms. The first floor enjoys a spacious landing, inner lobby leading to the bathroom and separate W.C. and four bedrooms. Panelled door with ornate fanlight with mosaic clay tiled floor, double radiator, archway partway through hall, stairs to first floor. Door leading to rear lobby. 11' 8" x 10' 3" (3.56m x 3.12m) Small paned window to the front. Built in storage and recess. Double radiator. 14' 7" x 10' 2" (4.44m x 3.10m) Small paned window to the rear. Recess either side of chimney breast. Attractive cast iron Victorian fireplace with slate hearth and living flame gas fire. Double radiator. 26' 3" x 8' 6" Kitchen area 10'0" Dining Area (8.00m x 2.59m) Kitchen area: small paned window with deep sill. Sink unit with mixer tap, solid wood fronted units. Space for fridge and space for cooker. Tiled splashback. Attractive arched brick recess with drawers and worktop. Extractor fan. Radiator. Slate flagstone floor. Door leading through to utility room. Dining Area: Small paned window to the front with seat. Double radiator. Attractive brick arched recess. With half glazed door and a covered entrance canopy, finished with slate open roof. Understairs cupboard. Door leading through to the kitchen/dining room. 13' maximum x 4' 5" (3.96m x 1.35m) Sink unit. Space and plumbing for washing machine and space for tumble drier. Velux skylight. Half glazed door leading to the rear area. With white suite comprising low level WC, corner wash hand basin. Attractive staircase approach. Impressive small paned window with window seat overlooking the garden and views to open farmland. Main landing with attractive feature arch. Double radiator. Small lobby leading to bathroom. Access to roof void with pull down ladder. 14' 10" x 11' 3" (4.52m x 3.43m) maximum. Small paned window to the rear with good views across to open fields and the sea. Attractive brickette open fireplace. Double radiator. 11' 10" x 7' 8" (3.61m x 2.34m) extending into wardrobe recess 9' 4" (2.84m) Small paned window to the front with window seat. Radiator. Wash hand basin with fluorescent light over. 11' 8" x 8' 8" (3.56m x 2.64m) Small paned window to the front. Two fitted cupboards. Radiator. 8' 3" x 6' 1" (2.51m x 1.85m) with door recess. Small paned window to front with window seat. Radiator. 10' 3" x 7' 3" (3.12m x 2.21m) Rolltop claw foot bath, with electric shower over, wash hand basin, two wall lights, large airing cupboard with Alpha gas fired combi boiler, downflow heater, and double radiator. With wash hand basin. Window to the side. 21' 6" x 10' 7" (6.55m x 3.23m) Pull down ladder to roof area, which is boarded. Power and light connected. Folding wooden doors to front. Window to the side. Outside to the front is a small natural slate paved area and from the roadside access to the garage. To the rear is a stone walled garden which faces a Southerly direction. The garden area is laid to level lawn with various shrubs and plants. Useful garden shed. There is also a large stone outbuilding which requires renovation and would make a lovely garden room or workshop.